Game of Thrones and Divergent spoilers. Fans of speculative fiction (sci fi, fantasy, dystopias) cry foul when a world that the author creates doesn't hold together. In a fictional universe, the author needs to set up rules for that world with care and consistency. For example, if you say in chapter 3 that dwarves can't fly, you can't have flying dwarves in chapter 13. I tend to think that all fictional worlds break down if you look carefully. Authors only have the responsibility to make the tears in the fabric of their worlds as infrequent as possible and to provide plausible cover, either by downplaying the issue or offering some patch, some nominal reason why it's okay. Many of these ruptures are mechanical; cf. flying dwarves. But some are rooted in character or theme. Which is why the Game of Thrones episode last night was so disturbing. It featured the notorious Red Wedding scene in which a large group of sympathetic characters are massacred at a wedding. George R. R. Martin is famous for unexpectedly killing off his heroes; the scene in which Ned Stark is executed still ranks as one of the most shocking scenes in all my years of fiction reading. But even if I accept the loss of these beloved characters, does the scene pass the smell test? Do the events of the Red Wedding make sense in the world of Westeros? Here are two reasons why they don't. 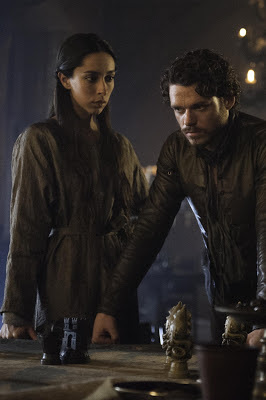 First, the world of Westeros has always been an uneasy mix of chivalry and brutality. These two can certainly coexist, but Martin's story has never made good on the chivalry half of that equation. There are sigils, an ethos of loyalty, bannermen, relationships between great families, customs and fanfare, rituals of hospitality, appeals to honor and tradition. But all of these things are merely window dressing; the world of Westeros is characterized instead by the unremitting flouting of loyalty, relationships, hospitality, honor, and tradition. For example, when Catelyn Stark says, "Walder Frey has known me his whole life; he would never hurt me," she appeals to the existence of warm personal and familial ties among the great families of the North. But when do we ever see evidence of these ties, of this warmth? Why would we believe this is true? You can't have characters behaving as if such things are real if you never show them being real. The Starks know Walder Frey better than the audience knows him, and even we know he won't forgive and forget. And this is the problem: In order for the plot to play out the way Martin wants it to, the Starks have to be incessantly stupid. Go ahead, Ned, tell Cersei that you're going to out her to the king. Please proceed, Catelyn, with releasing your young son's most important political prisoner. By all means, Robb, bring your lovely bride to meet the lecherous, crude, and corrupt old man whose daughter you promised to marry. As it happens, earlier this week I read Divergent, the first volume of the popular YA series. It's a very nice book, but suffers from a different type of world-building weakness. In a Chicago of the future, after some sort of societal breakdown, the survivors have organized themselves into five different factions: Abnegation, Amity, Dauntless, Erudite, and Candor. The members of these factions are responsible for serving, friendship, courage/military, intellectual pursuits, and honesty, respectively. Does anyone believe that this is how a postapocalyptic society would re-form itself? It seems unlikely in the extreme. In some ways, this kind of weakness is easier to take than the incessant falsities of Westeros. In the world of Divergent, you have to accept one whopper rather than a hundred separate unlikelihoods. But still, it's off-putting. And it makes me appreciate even more the brilliance of The Hunger Games. Would society re-form itself by one strong group pressing the others into poverty and forced labor while they go to clubs and party it up? I think we know the answer to that.